Euronoise is the European Conference and Exhibition on Noise Control organised by a national acoustical society on behalf of the European Acoustics Association (EAA). Next year EURONOISE 2018 will be held from 27 to 31 may in Heraklion, Greece. Attached to this document you will find announcement about it. 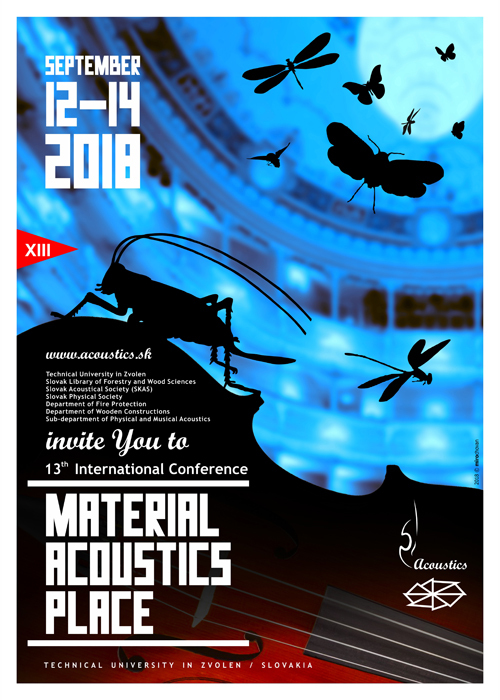 13 th International Conference "Material - Acoustics - Place 2018"
Prof. Ing. Július Puškáš, CSc. Monike Rychtárikovej, členke Slovenskej akustickej spoločnosti pri SAV a predsedníčke odbornej sekcie Stavebná a priestorová akustika bolo udelené na návrh rektora STU v Bratislave, prof. Ing. Roberta Redhammera, PhD. významného ocenenie Vedkyňa roka 2015. Monika Rychtarikova as a member of Slovak Acoustical Society (SKAS) is now the Female scientist of the year 2015 in Slovakia. The European Environmental Agency has just published a report on Noise Pollution as a major environmental problem in Europe. The purpose of the ICA is to promote international development and collaboration in all fields of acoustics including research, development, education, and standardisation. All ICA Newsletters (and the previous Letters) will be available at www.icacommission.org, under menu tab "Letter from President". Euronoise 2015, the 10th European Congress and Exposition on Noise Control Engineering, will be held at the heart of Europe where the first treaties leading to the creation of the European Union were signed. Acousticians and noise experts from all over the Europe will gather for the event on noise control, and soundscape in Europe, organised by the European Acoustics Association. The Belgian and Dutch acoustical societies, ABAV and NAG, warmly welcome you to Maastricht for Euronoise 2015.
International Conference "Material - Acoustics - Place"
Informácia o pripravovanom európskom workšope k výsledkom projektu "NOMAD" (kontrola úplnosti údajov o hluku v návodoch na používania strojových zariadení). Woršop poriadaný pod záštitou Európskej komisie sa bude konať 18.júna 2013 v Bruseli, Belgicko. V priložených 4 dokumentoch sú uvedené podrobné informácie o tomto workšope vrátane prihlášky na woršop a programu workšopu. 2013 will mark the 50 th anniversary of the foundation of the Institute of Sound and Vibration Research, at the University of Southampton, UK. To celebrate the achievements of its people, past and present, we will be hosting a two-day symposium on the 11 th and 12 th July 2013. Table of Contents and the issue is online at Ingenta. 3. ročník konferencie "Hodnotenie kvality prostredia 2012"
to learn more about the session topics, find guidance for writing abstracts and papers, and to submit your abstract. Papers are due 15 May 2012.
will take place at the Prague Congress Centre (PCC), May 22-27, 2011.
will take place in Rio de Janeiro, Brazil, from 10 to 14 July 2011.
organized by the Faculty of Technical Engineering from Bihac and Society for Robotic of Bosnia and Herzegovina. in Acoustics 'EAA Summer School for young researchers') is online. ICA 2010, The 20th International Congress on Acoustics, 23 – 27 August 2010, Sydney, Australia.